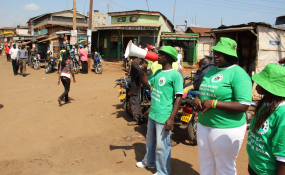 Members of Tupange - an organization that promotes family planning and reproductive health - recruit people to a health clinic in Nairobi, Kenya. Excellencies, Distinguished Guests, Ladies and Gentlemen: It is a great pleasure and honour to take part in this landmark event. On behalf of the Government and people of Ethiopia, let me start by thanking the Government of the United Kingdom, the Bill and Melinda Gates Foundation, and all those involved in the organization of this momentous Summit. Secretary Mitchell and Mrs Gates - your personal commitment to advancing the health and rights of women and men throughout the developing world is an inspiration to all of us. We salute you for all your dedicated efforts and leadership. Ladies & Gentlemen: Today, we have before us a unique opportunity to transform the lives of millions of women and men around the world, by resolving to accelerate access to family planning. Timing is of the essence. And I say this because I truly believe that the key conditions for achieving real and unprecedented impact are now aligned like never before. I want to highlight three key ingredients in particular. First, the progress already achieved in building up health systems and improving health outcomes over the last two decades provides us with a stronger footing for scaling up access to family planning. Reinforced by the 2015 MDGs, countries have achieved tremendous progress particularly on the first two parts of the 4-point ICPD action plan set 20 years ago in Cairo: universal access to education; and reducing child mortality. In fact, emboldened by the substantial global progress on child health, last month, in Washington DC, we launched a new global call to action on child survival. We all came away from that meeting greatly energized. Of course, we know that improved child survival has a significant impact in increasing demand for family planning. Importantly, we agreed that stronger emphasis will be needed on advancing a continuum of care for maternal, newborn and child health. Second, family planning - which has proven to be a highly politicized issue over the years, is now starting to be seen in a different light by many. Providing access to family planning is about social justice. It is about upholding the rights of women and men to choose. It is about empowering them to take control of their own lives. However, our progress in the latter two ICPD objectives - reducing maternal mortality and broadening access to reproductive health services and family planning has been relatively slower. Why? I believe largely because all the key conditions for success, had not been adequately aligned - strong political will, real country ownership and a commitment to understand and work together with communities to address socio-cultural and economic barriers to accessing health services, as well as the investments needed in building national capacities to deliver the services at scale. This summit, I believe, will be a real opportunity to turn things around. Thirdly, today we have studies that have shown that voluntary contraceptive use can avert more than half of all maternal deaths in the developing world . This result lays bare our moral obligation to ensure universal access to family planning. Inaction is no longer an option. Also, In order to really impact maternal health, we must continue to push on all the other key factors, including ensuring girl's education, access to skilled birth attendance, and overall improvements in living conditions. *** Let me now turn to the encouraging progress my own country Ethiopia is already making on family planning. Our Government is committed to enabling women and men to choose whether, when and how many children they have through the use of proven family planning methods. We are building a women-centered health system and family planning is part of our efforts to improve the health of women and girls. We now have in place a strong primary health care service. Health extension workers in every village across our country are reaching women with vital reproductive health and family planning information. As a result, we have seen an unprecedented upsurge of real voluntary demand for contraceptive. The broader range of free modern contraceptive options we offer has also been key to fuelling demand. And we have made significant progress in meeting this demand. The unmet need for family planning in Ethiopia has declined, and the contraceptive prevalence rate has doubled in 5 years. Based on the current trends, contraceptive prevalence rates will reach 65% by 2015 by reaching additional 6.2 million women and adolescent girls. First, recognizing that early childbearing is a major contributor to maternal mortality, we are now targeting our efforts on adolescent girls (15 to 19 years) who have the highest unmet need for family planning. Second, we must do more on ensuring commodity security by both strengthening the supply chain and expanding the contraceptive methods we offer. Third, although we are increasing our national budgetary allocations to family planning each year, we still have a 50% funding gap for commodities. We will make family planning a cross-sectoral development issue by securing family planning commitments across all stakeholders and all leadership levels. We will make more domestic funding available for family planning. We will focus more efforts on adolescent girls, by expanding youth friendly services. Ethiopia is committed to take a very bold action and will never shy away. We will fight because it's a cause worth fighting for. We also count on the continued support of all our partners. We have very high hopes that this landmark initiative will help us mobilize the resources and ensure affordable market to make a lasting difference in the lives of millions. In closing, let me just add that it is not what we promise here today but what we will do when we go back home that matters. Let's seize this opportunity today to give millions of people the choice of how they will live their lives tomorrow. If united anything is possible. I wish us a successful summit.